Assemble them right before guests arrive or let people do their own. Cracker, cheese, spread. Yum! My mom's zucchini bread is so good. I bake a ton of it when zucchinis are in season and abundant at the farmers market, cut the loaves in half and freeze them. Every few weeks I can satisfy my morning sweet tooth with a slice of zucchini bread, warmed and slathered with butter. I grew up eating and loving this "bread" which is more like cake than bread. My friend Shannon tried the recipe making a few adjustments and did mini muffins instead of bread pans. They are healthier than my original recipe and I love the mini muffins. Great for kids snacks and equally good with my coffee for breakfast. Preheat oven to 325. Mix first four ingredients together. Then add the rest and stir to combine. Put into mini muffin pans (greased or with paper cups). Cooke for 22-25 minutes. Remove and place pans on a wire cooling rack for 10 minutes. I'm back on a rainbow smoothie kick. I love this smoothie because it's packed with goodness and my kids beg for more. My friend Jen turned me onto another great new recipe from Gwyneth Paltrow's It's All Good cookbook and a great way to meal plan. 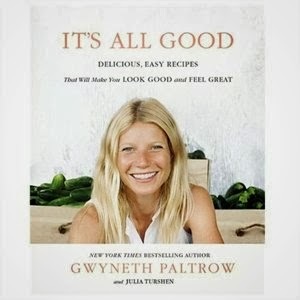 She was making Gwyneth's turkey meatballs and realized that all the herbs in the meatballs are also used in Gwyneth's Perfect Herbed Grilled Chicken. 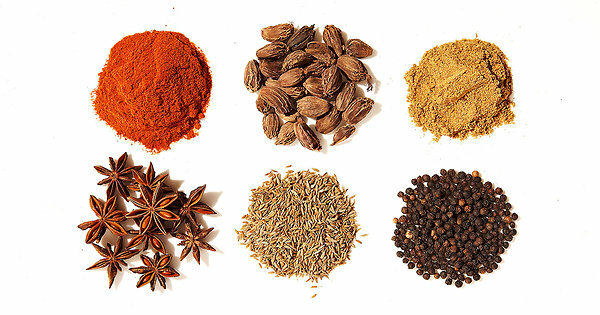 Buying five different herbs is fine if you can use them again but I hate throwing out herbs that have gone bad. The chicken uses all five (sage, basil, thyme, rosemary, parsley) so I made meatballs last night and chicken tonight. Both are delicious recipes with lots of leftovers. I butterfly the chicken breasts before pounding it thin. So much faster to get it to 1/4" and I do like that super thin style chicken. The marinade was quick and easy. I used the same amount of marinade but only two chicken breasts (instead of four). I marinated it for an hour and a half. Sauté in a hot pan with olive oil and it's ready in a flash. I served with steamed broccoli and the spinach Caesar I just posted. It was such a satisfying and healthy dinner. I will most definitely make this recipe again. This Spinach Caesar was inspired by my friends Whitney and Marly and different salads they've each made me lately. I took Whitney's simplicity with Marly's knack for spicing up store bought dressing and made a Spinach Caesar. Loved it. Put ingredients in a blender and blend on high. Toss with spinach, then sprinkle with parm and pepper. Serve. One of the best food items I discovered in the last year is the Hama Hama crab cake using their secret Grandma Helena's recipe. They are the best crab cakes I've ever had and I was addicted immediately. I started buying them every week at the farmers market because they're perfect for a quick family dinner while also being good enough to serve to guests. One of my easiest recipes that everyone will eat is a pan-fried, thin-cut pork chop. They are a simple, fast, and healthy main course. Last night I served these to the kids with a chunk of cheddar cheese, some cashews and banana. It was my low effort version. Some nights I will finish the pork chops with a splash of soy sauce and serve with brown, white or fried rice and a green veggie which feels more like a proper dinner. Rinse the pork chops and pat dry. Cut a chunk of the ginger and set aside. I peel the skin but not required. Crack a few cloves of garlic and cut off 1/3 so you have a large open edge. Now rub each side of the pork chop with the ginger and garlic. This just gives it a bit of flavor. Sprinkle with salt if using and lots of black pepper. Sprinkle with a touch of flour if using. Heat olive oil in a sauté pan on medium-high heat. When hot, add the pork chops. Once browned on the first side, flip over. Brown on the other side, then remove from pan. It only takes a few minutes to pan fry the pork chops because they are so thin. Sprinkle with a splash of soy sauce if using and serve. Tonight my kids helped me make Ina Garten's Lemon Yogurt Cake. They love it for dessert. I love it for breakfast with coffee. Everyone is a winner! Marly made this recipe for Braised Beluga Lentils with Kale & Rosemary tonight and we both loved it. 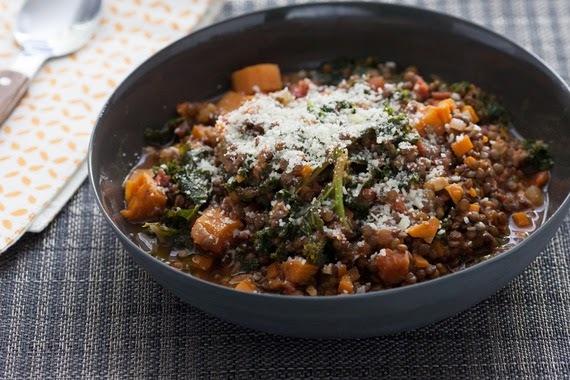 Perfect one pot dinner that's flavorful and super healthy (lentils, veggies and an entire bunch of kale!) So good. 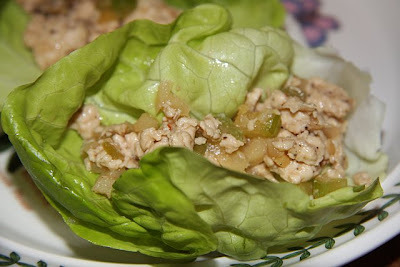 I forgot how good this recipe is for Healthy Lettuce Wraps and haven't made it for years. It's delicious. Served it tonight with edamame and steamed broccoli. Kids loved the chicken because it's so salty from the soy sauce. Great dinner that can be prepped and cooked quickly. Marly made a delicious Caesar with a mix of romaine and kale and a really flavorful chicken inspired by Marion's Mint Chicken. It was a very satisfying dinner that had to be shared. This is not an exact recipe but based off her memory. Marinate for 2 hours, then sauté in a pan with olive oil. Use romaine, kale, croutons, parmesan, chicken and dressing. Toss and serve. As you may recall, I'm completely obsessed with asparagus so I'm always looking for new recipes to use my favorite veg. Last spring my friend Marly made this Asparagus Gruyere Tart and I was so crazy for it that I made it several times after. This is a must-try recipe once fresh asparagus arrives so stash it away but don't forget! Another great find by Marly. 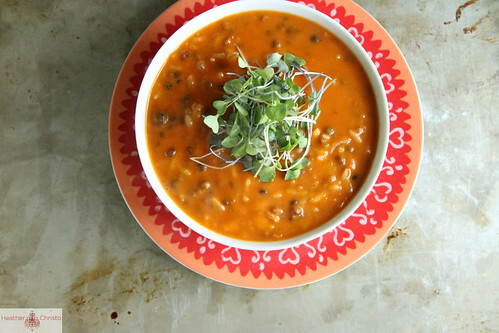 She made Heather Christo's Spicy Tomato Lentil Soup one night and we both gobbled it up. So good. And I loved how easy the recipe sounds. Great weeknight dinner. This and a kale salad is a perfect dinner to me. My friend Clare told me about this recipe for Whole Wheat Spaghetti with Swiss Chard and Pecorino Cheese. It's really good. I use regular spaghetti though (rather than whole wheat). Easy and flavorful pasta. Marly is a master at salads. She is always making new ones and they never disappoint. She made this Kale Salad with Meyer Lemon Vinaigrette one night and it was delicious. It's hearty and flavorful. Will definitely make it sometime soon. I absolutely love Vif, the new cafe and wine bar on Fremont Ave. I love going there with a friend for lunch and a glass of wine, going alone to work and get coffee and treats, or grabbing delicious take out when I don't have energy to cook. They also have a great wine selection so it's hard to get out of there without grabbing a good bottle for the stash. I had this panini there one day and loved it so much that I've been making it at home. 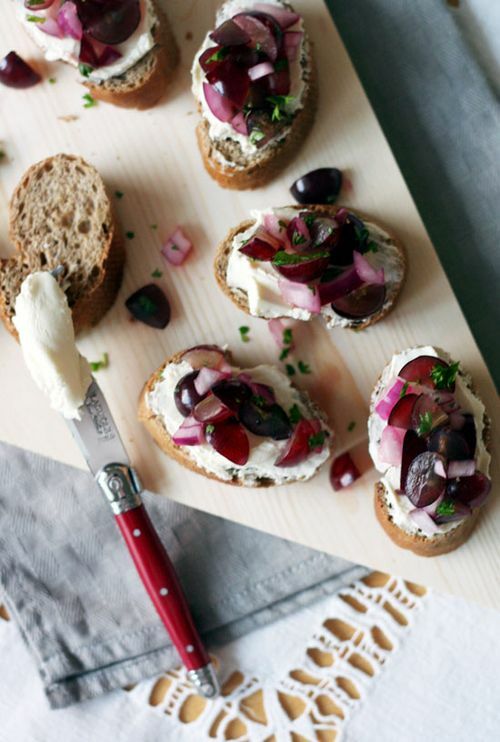 Assemble, brush with olive oil and grill on a panini press. My friend Marion introduced me to this simple dinner and now I make it all the time. It takes no time to make and is so satisfying. While you heat the beans and toast the bread, you fry the egg. It is so fast. I make this for me and then serve the same items side by side for the kids because they would never go for the beans sandwiched between toast and an egg. This is a new staple in my house. Thank you Marion!!! "Chef and co-owner Tommy Habetz puts the salad in ciabatta rolls spread with mayo and mustard, adds medium-sharp cheddar and sliced garlic dill pickles, and then grills the works in a panini press." Follow the recipe and you will love it. Another great recipe from Marion. Good for adults and kids. Marinate for an hour or two, then grill on the BBQ. I love making paninis for dinner. It's fast, it's delicious and the kids eat them. 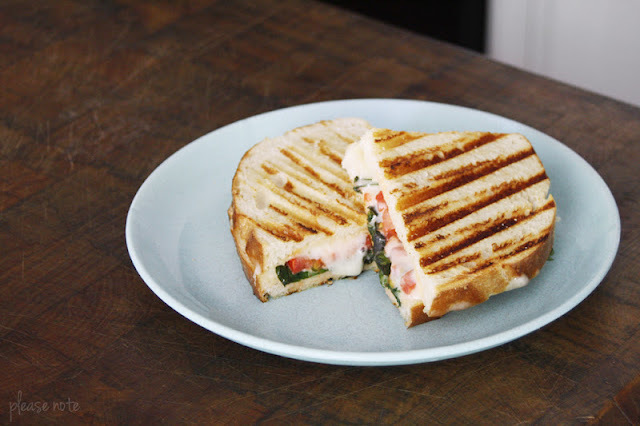 My friend Marion made me this panini one day for lunch and it's now in my rotation when tomatoes are in season. So good! Every few months I host an Indian potluck with 3 or 4 friends. Everyone prepares a different dish and we have the most delicious feast. We always have lots of basmati rice and my friend Marion taught us how to plate the rice in a cross formation to separate all the curries and sauces from running together. Genius. She also usually brings homemade naan which is yummy and helps soak up all the sauces. It is such a fun dinner party and so many great new recipes are introduced. I highly recommend it with friends who love to cook and experiment. For one of the potlucks I made Chickpeas in Star Anise and Date Masala recommended by my sister and adapted from a Vij's cookbook. It was a great dish and a fun way to mix it up. Great flavors and a good snack in the fridge for days. I will definitely make this dish again. My friend Ali made this delicious Manchego Salad one night with baby spinach and radicchio from her garden. It was such a treat. Delicious. My friend Ali introduced me to Socca and now I'm obsessed. She made it to go with the roast chicken we made one night and I loved it together. I had never had anything like it. It's a great replacement for bread with dinner and it's gluten and dairy free for those who are interested. I like how peppery it is. Great as a side or served with some type of yummy cheese. The recipe that I've been using is here. Ali sent me this recipe that I also need to try. 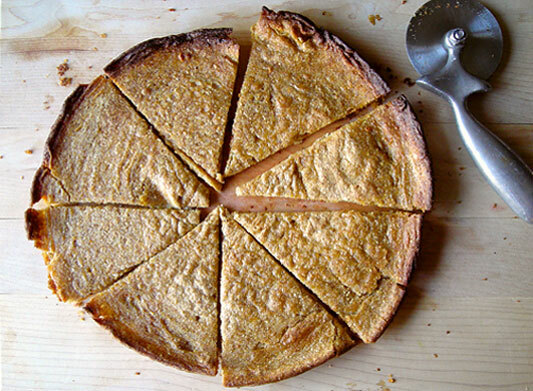 Learn more about skillet flatbread from Mark Bittman here. My friend Amy made me these pancakes and changed my life. They are so amazing. I don't know what it is but they are SO good. I love the texture and I especially love the berry sauce on top. Perfect combo. 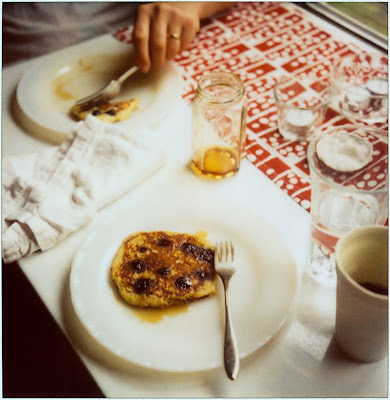 I use Orangette's recipe for Oatmeal Pancakes with two important revisions... I only use a 1/2 stick of melted butter (a whole stick is just too much) and I add about a tsp of ground cinnamon to the batter. As for the berry sauce, I just cut up fresh berries, rinse (and leave damp), sprinkle with sugar and let sit covered in the frig over night. In the morning, I stir and crush with a fork. When we don't have fresh berries, homemade berry jam is equally as good… I also like a dollop of yogurt sometimes, too. I am obsessed with Mark Bittman's recipe for Roasted Chicken With Preserved Lemons. It is foolproof and delicious. My friend Marion made this appetizer and we all loved it. It's something new and different. I made it for Thanksgiving and it was a hit with everyone. We used jalapeño and skipped the red onion. Delicious! My friend Marion made this recipe for Spiced Lentil Soup with Coconut Milk and brought me some. I loved it so much I've already made it a few times. She used both curry and turmeric so just used half of each. She used lemon. When following the recipe I find that it's less brothy than the photo so I do as the recipe suggests and add extra stock (preferably homemade chicken stock) or some water to get more broth. Love this soup. Don't forget the garnishes. The coconut and cilantro are key. Loving Gwyneth's Turkey Meatballs and Go To Tomato Sauce served over spaghetti noodles. Delicious dinner. 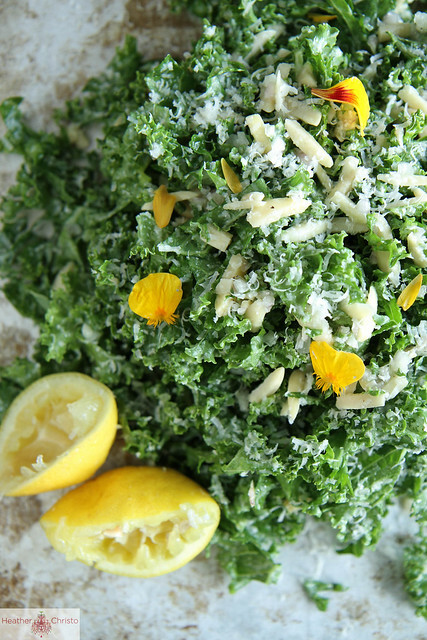 My friend Heather had me over for dinner one night and made her Kale Salad with Lemon, Almonds and Pecorino. I loved it and have made it countless times since. It's a new staple for me. My friend Marly made this salad for a "Friendsgiving" dinner that our friend Ali hosted (Thanksgiving dinner with friends, not on Thanksgiving). I loved this salad and I loved the color. Will definitely make this one day. I'm not back to blogging, just back to posting recipes. I continue to use my blog for recipe ideas all the time. It's how I meal plan, grocery shop, and remember what I've made. It's helpful to have all my favorite recipes available online and in one place so I'm going to start posting recipes again. Feel free to visit for new inspiration and as always, please share anything good you've been making. 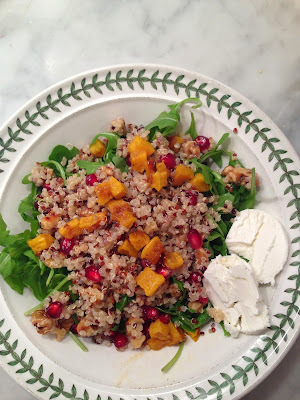 I had this great salad at Vif and thought I would try to make it at home. It was pretty, delicious and healthy. I used Gwyneth's Apple Cider Vinaigrette. I kept the arugula separate so it wouldn't get soggy as leftovers, and just tossed in before eating.